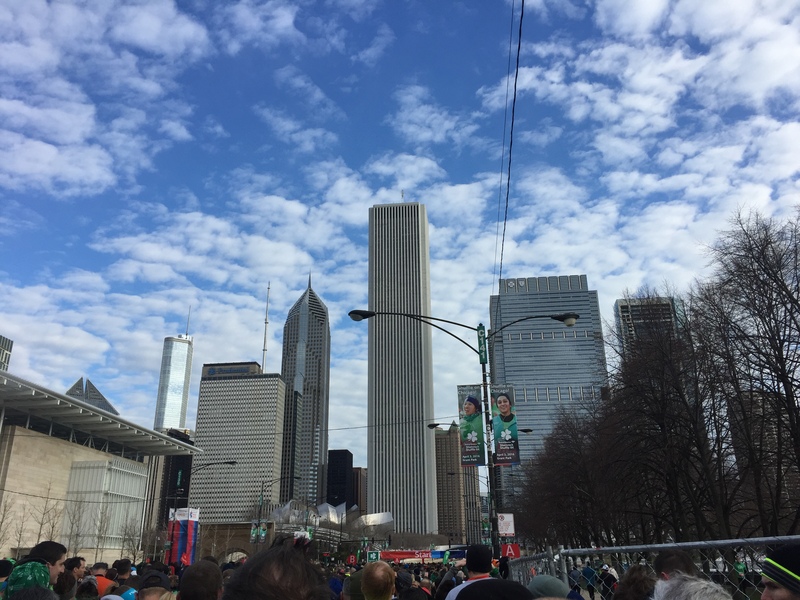 Today I ran one of my favorite races, the Bank of America Shamrock Shuffle. It was my 8th time running it. As mentioned in yesterday’s post, the goal was to take it easy and have fun. So yep, that means no PR which is fine with me. We had some crazy weather on Saturday. It seemed like every two minutes it changed from sunny, windy, snowy, repeat. Definitely crazay. I am so glad it was like that on Saturday instead of Sunday. Sunday morning my alarm went off but I hit the snooze button twice. I did not want to get up. Eventually I did and I made coffee and a peanut butter sandwich. I felt so full afterwards. Around 7 I drove to the train station to get downtown. Once there I made my way to The Congress Hotel to use the bathroom and wait in a warm place for the race to start. Well, at least till 8 or so because I had to check in my gear bag and be at my corral by 8:20am. I made it with less than 2 minutes to go. I saw Lisa in the bathroom and then met up with her afterwards. I met her husband and a few of her friends. We talked for a bit and then it was time to go. 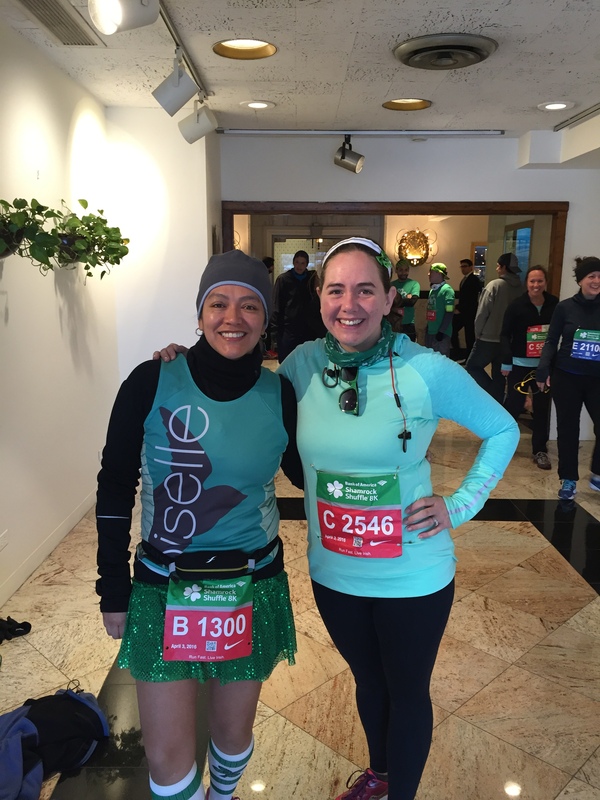 It was cold but yet I wore two long sleeve shirts, my Oiselle singlet, shorts, sparkly skirt, and compression socks. I knew that I would warm up once I began running. And yep that is exactly what happened. 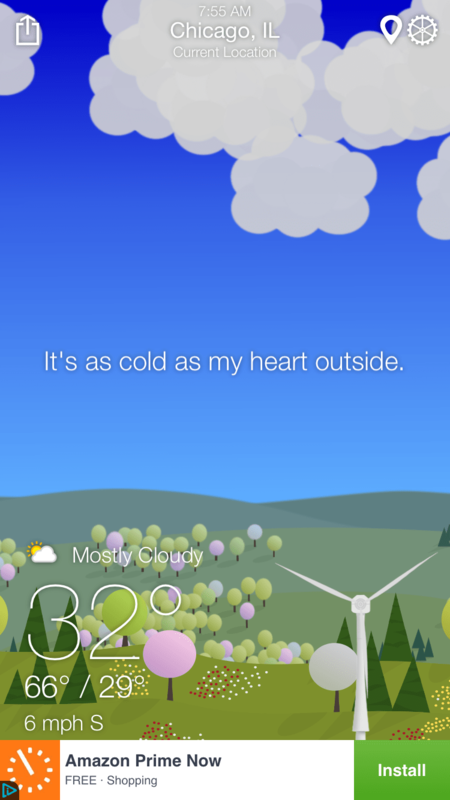 I don’t think I ever felt really cold like I did last year. My Garmin lost signal underneath the tunnel on Columbus. It happens every single year. Once I regained signal my splits were 1 minute faster. 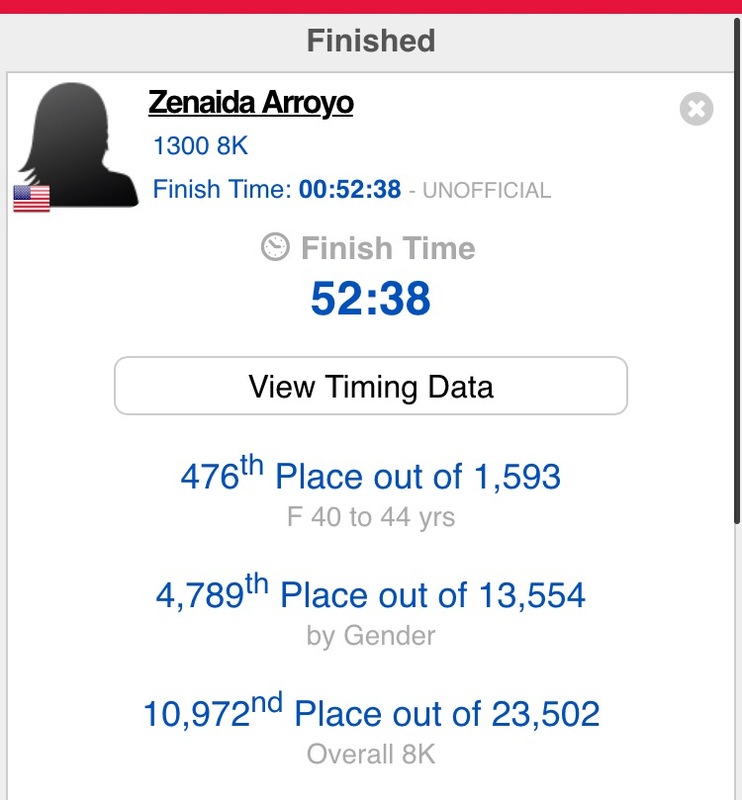 Of course I did not know this then but was in disbelief when I would see my splits. I reminded myself that it was supposed to be an easy run and not a PR race. I stopped to walk, got Gatorade at the water stations, and simply just enjoyed the race. I saw Lauren and she passed me up. I am surprised I saw anyone I knew with a race of over 30,000 runners. Once I turned into Michigan Avenue I knew I was close to the finish line. Well, maybe not that close. You see, this race has one of the worst finish lines. There was an incline which I walked (I call it Mt. Roosevelt) and then once you get to the top, you still need to run about an additional quarter mile to the finish line. Terrible, terrible. After the race I waited for my friends to finish so we could get our beer and then have brunch. By then the sun was out and it felt really good to be out there. 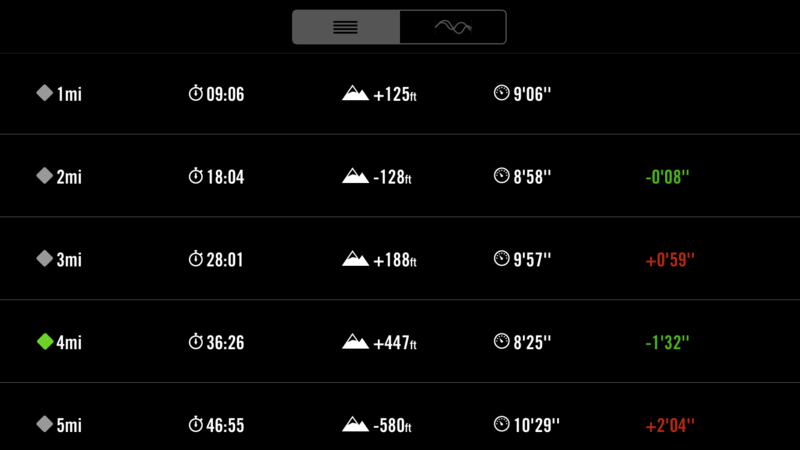 According to my watch, I ran 5.55 miles in 52:40 with a 9:29 average pace. However, my official finish time is 52:38 with a 10:30ish average pace. So weird. 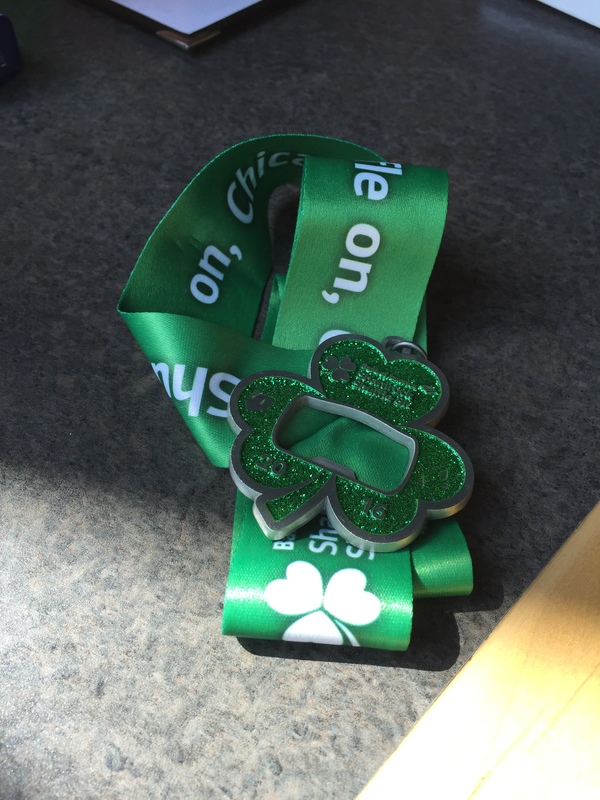 I enjoy reading about race recaps and I’m hosting a linkup for the Shamrock Shuffle 8K. The rules are simple: linkup your race recap from this year. It’d be great if you linked back to this post, but no pressure. 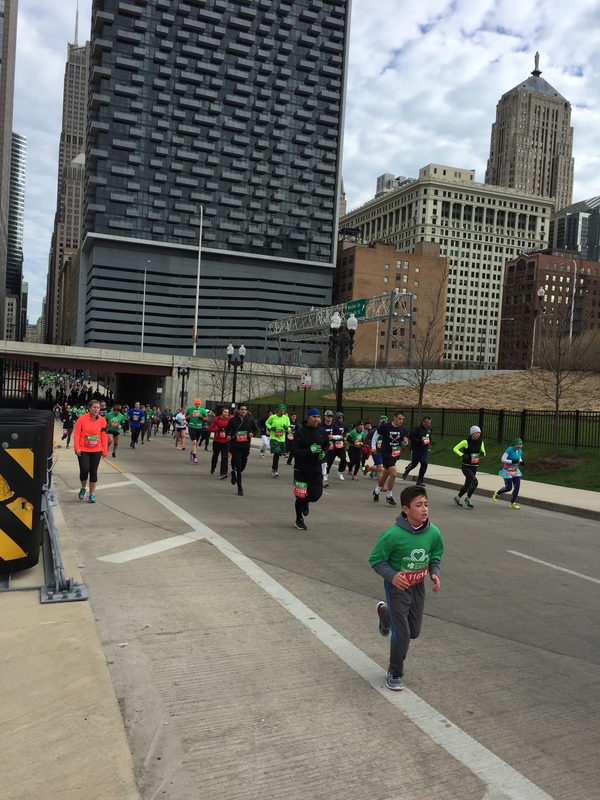 This is just for fun — but remember: only Shamrock Shuffle Race Recaps. I hope this works. This is my first time doing this so just bear with me. Thanks. Sounds like the perfectly executed fun run – kudos! Thank you! You had a great race too at the Cherry Blossom Ten Miler. Congrats! It is on my list of races to run next year. +1 on all the Garmin issues and on that terrible finish on Columbus. I always think that once I make that turn off of Roosevelt, then I’m nearly done – but you are right, that final quarter-mile on Columbus is really deceptive. Love your sparkly skirt!!! Glad you had a good time and got to hang out with Lisa and her husband/friends! Thanks Emily. Luckily there aren’t too many races (or are there) with that same finish line. Well, the Chicago Marathon is one of them which should definitely be changed. I must start a petition right? Congrats! This sounds like a super fun race and I love your outfit. Cute! Thanks. I love sparkly skirts and hope to wear one in all of my races. +1 on Garmin issues. I don’t think it’s ever been that bad for me… but I’ve got one of those fancy new watches so maybe that’s the reason. It was so good to see you when I did — I was working on side stitches and hate them so much! Glad you had a good run! I never have Garmin problems but only when I run through that tunnel. The same thing happened at the Chicago Marathon. Oh well. 🙂 Life goes on. Congrats on the solid race! Pacing in this race is so hard because of the buildings and tunnel, it’s a great exercise in running by effort 🙂 nice seeing you yesterday! I ran an extra mile too according to my watch. Ha. Oh well, you gotta love those darn buildings and tunnels. 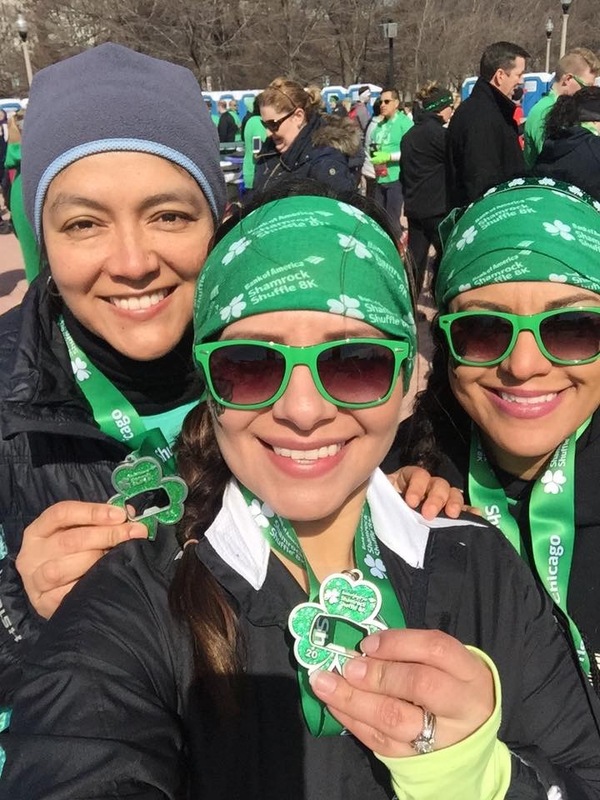 The Shamrock Shuffle glasses look great on you!!!! Thanks! Wow, an extra mile? That is just nuts. But still overall it is a great race.